Radiation therapy is a method of cancer treatment that uses high energy radiation to shrink tumors and kill cancer cells. Radiation kills these cells by destroying their genetic material so that they are unable to grow and divide. There are two types of radiation therapies. Also called brachytherapy, Internal Radiation Therapy uses radiation in the form of an implant. This radioactive substance can be inserted close to the tumor, or directly inside of it. Internal radiation is typically used on small tumors, confined to one area of the body, and may require a hospital stay. A more common method, External Radiation Therapy can be used for most types of cancer, even if the cancer has spread to other areas in the body. During this process, high energy radiation beams are administered externally, and it is typically performed on an outpatient basis over a one to two month period. While radiation does damage healthy cells as well as tumors, most of these cells are able to recover from radiation therapy, and function normally again. The goal of radiation therapy is to destroy as many cancerous cells as possible, while causing least amount of harm to the surrounding, healthy tissue. Side effects vary greatly from patient to patient, but most commonly include fatigue and skin irritations. For more information about side effects of treatment, please click here. Advances in radiation therapy techniques are constantly evolving. Intensity Modulated Radiotherapy, IMRT, Image Guided Radiotherapy, IGRT, are techniques that have certain advantages more traditional methods lack. IMRT uses beams controlled by a computer to deliver high radiation doses to a tumor. This procedure allows for doses with a higher concentration of radiation to be administered, because the beams can conform more precisely to the three-dimensional shape of the tumor. Because the precision of this method is so precise, the surrounding healthy tissue is not as affected by the radiation. IGRT goes a step further than IMRT by using digital imaging techniques to track the exact position of the tumor before each radiation treatment. This technique is highly beneficial since tumors are not stationary, and tend to shift between radiation appointments. Better overall tumor control means that side effects from radiation therapy are reduced. Another benefit of these advanced techniques is that tumors that used to be difficult to treat, because they were next to a vital organ or hard to reach, are now able to be targeted. 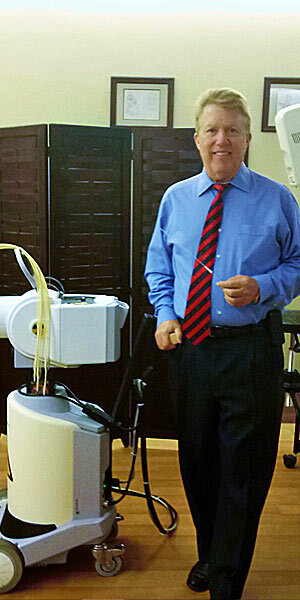 Because of IGRT’s advanced motion management technique, a patient is now able to breathe normally during radiation treatments, something that was not an option with traditional radiation methods. Please click here for Frequently Asked Questions about Radiation Therapy.